Kosmas Epsilon kicks off our maiden GroovCast, a monthly mix created exclusively for Groovanauts.com by some of the world's most talented DJ's. For those of you unfamiliar with Kosmas, here's a bit of backgound info: Kosmas was born in the small town of Xanthi in Greece, on May, 1978. At the age 8, he started taking music lessons for the next 5 years. It was 1991 when he first fell in love with electronic music. Kosmas and his friends started doing parties all around Greece, sometimes for 20 people, other times for 200 people, but always underground with the most upfront electronic dance music. Kosmas was a DJ all these years, but something was missing. This happened when he realised he wanted to make his own tunes to play out. Today, he is considered to be one of the most talented and upcoming producers, not only in his country, but worldwide. In 2002, after experimenting with cheap software and synths, Kosmas came up with some serious stuff in 2003. That was when he had his first ever release, his bootleg remix of FC Kahuna's “Hayling”. Top-charted by James Holden, he loved it so much, that wanted to include it in his Balance 005 compilation. After that, things turned out to be a lot easier for Kosmas to showcase his productions and Djing skills. His tracks have gained great support and are being played by renowned DJ’s such as Sasha, John Digweed, Nick Warren, Dave Seaman, James Holden, Hernan Cattaneo, Desyn Masiello, Marcus Schulz, Pete Tong, to name but a few. 2004 saw him winning the title of the best new Greek DJ, which also significantly increased the number of gigs where he has been asked to play. 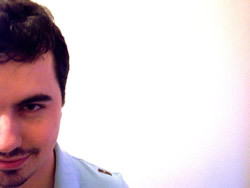 In 2006, Kosmas started his own radio show on Proton Radio, one of the best internet-based radio stations, representing electronic music at its finest. His show 'Personal' is aired every 3rd Wednesday 'On Demand', including 3 full hours of music, one by himself and two more from DJ's & producers that he admires & respects. Guests have included Dave Seaman, Desyn Masiello, Demi, King Unique, Elias Tzikas & many many more. In the summer of 2006, Kosmas has also released his first mix compilation for the legendary Platipus Records, alongside Luke Chable. The cd got some great reviews by the media worldwide, and from the fellow bigname djs also. 2007 has been a year of reading, learning new techniques, trying to make innovations to his sound. This will should keep the fans excited, considering the huge amount of tracks and remixes he has planed for the months forthcoming. Dave Gardner – Growler (Kosmas Epsilon mix) – Whoop!